ARE YOU STILL HEARING WHAT PEOPLE SAY? Every day you face dozens of important decisions -- but have you heard everything you need to know to make the right choice? 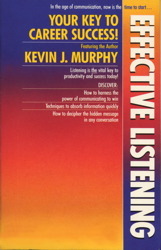 Kevin J. Murphy believes that listening is the most neglected managerial skill. In this powerful audio program he demonstrates what effective listening really means -- and what it can do for you.  The techniques that allow you to absorb a multitude of information quickly and accurately.  How you might be preventing people from talking openly to you -- and how to help them get their messages through.  How to tune into the hidden message in any conversation.  How to use listening skills at job interviews and in group discussions. From your boss to your co-worker to the people working for you, this program demonstrates that what you haven't been hearing is hurting you -- and that listening is a vital key to productivity and success today. bland and mostly common sense.